As Vilnius continues to build on its reputation as a dynamic city that has something for everyone, one thing that hasn’t changed much over the years is the value visitors find here. From spending a few days discovering the city’s UNESCO World Heritage Old Town, to taking in the local arts and restaurant scenes, Lithuania’s capital lets visitors do more for less. The UK Post Office’s 9th Annual City Costs Barometer supports this claim, ranking Vilnius the second most affordable city on their latest list. The 2017 City Costs Barometer surveyed 36 cities across Europe and determined their rankings by performing a comparative cost analysis. Finishing just behind Paphos (Cyprus), Vilnius offers considerable value compared to its Baltic Sea Region counterparts and the Western European destinations on the list. The Barometer reflects costs associated to ‘city breaks’ – short holidays in cities that are easily accessible from the UK. At around €160 (£139.48) for 12 typical city break costs – including an evening meal for two with wine, drinks, two nights’ weekend accommodation, sightseeing and city transport – Vilnius is surprisingly accessible, even as its economy grows and foreign businesses continue to discover it as an ideal city in which to set up shop. 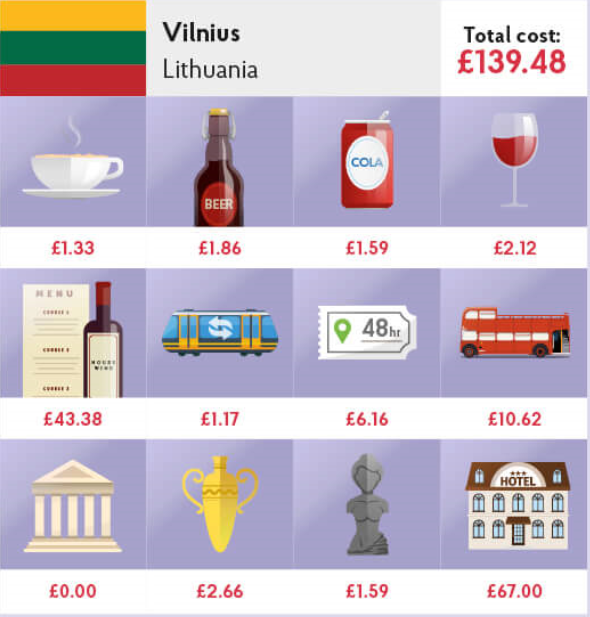 In a press release announcing the City Costs Barometer rankings, Andrew Brown of the UK Post Office pointed out, “It is important for holidaymakers considering a city break to budget carefully for items like meals, drinks and sightseeing, as these are the costs that most tourists cannot avoid.” That said, visitors have a lot of low-cost options to choose from in Lithuania’s capital, and can save on major sightseeing activities by making use of visitor-friendly initiatives like the Vilnius City Card. Beyond low-costs, visitors to Vilnius find value in the city’s unique characteristics that help to set it apart from the other destinations on the Barometer. From its mix of European period architecture, to its abundance of urban green spaces and the leisure activities they offer, there’s a lot to be pleasantly surprised about. And it’s not all about surprises, either. Hot air balloon rides over the city centre, delicious contemporary takes on classic regional cuisine, and a vibrant nightlife have been Vilnius staples for a while. Add to that the numerous annual festivals dedicated to both local and international arts and culture, and you have a city where great value is just another reason to take the time to visit.